(NAPSI)—International selling may seem daunting, but thanks to the Internet, it’s more attainable than ever. With the right tools in place, small businesses can go global and increase revenues without the headache. Canadians are e-commerce enthusiasts—in fact, 60 percent of Canada’s online shoppers buy from U.S.-based sellers. As an added bonus, there’s typically no language barrier for U.S. businesses selling into Canada. Given this opportunity for U.S. small businesses, the U.S. 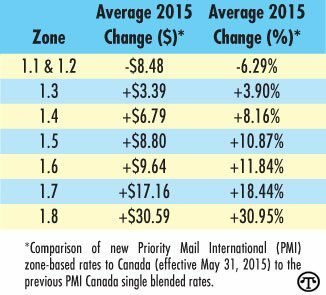 Postal Service opted to create zone-based pricing for all Priority Mail International® shipments headed to Canada starting on May 31, 2015. This means that the USPS will charge for shipping based on the U.S. origin ZIP code and the Canada destination postal code, instead of blending expensive routes into one flat rate. There will now be seven pricing zones for shipping. Some rates will increase, but for businesses in major cities—such as San Francisco, Miami and Chicago—savings will be around $8 per package. Latin America is the world’s second-fastest-growing e-commerce market, and leading this boom is Brazil. With 202 million citizens, of whom 33.5 million shop online, Brazil presents a huge opportunity for U.S.-based businesses looking to expand, though it’s not without its challenges. Due to delays in customs clearance, postal packages could take up to 20 days to arrive. Duties and taxes, as well as complicated custom forms, slow the process for both U.S. merchants and the buyers. However, there are solutions. Shipping technology company Endicia just launched a program called Endicia Global Service, which allows shipments from U.S. businesses to reach Brazilian customers in as little as 8 days. Additionally, duties and taxes can be paid by the buyer up front, and there are no complicated customs forms to fill out. To learn about the tools you need to succeed in going global, check out www.endicia.com/go-global.